When Bernice was eight, she and her family were sent out of their community to live in isolation due to accusations of witchcraft. These sorts of accusations are a result of deeply embedded traditional beliefs about spirits, borne out of a lack of information or education around various health issues or unexplained events. Bernice and her family were persecuted by their community and as a young child she witnessed the upsetting consequences. 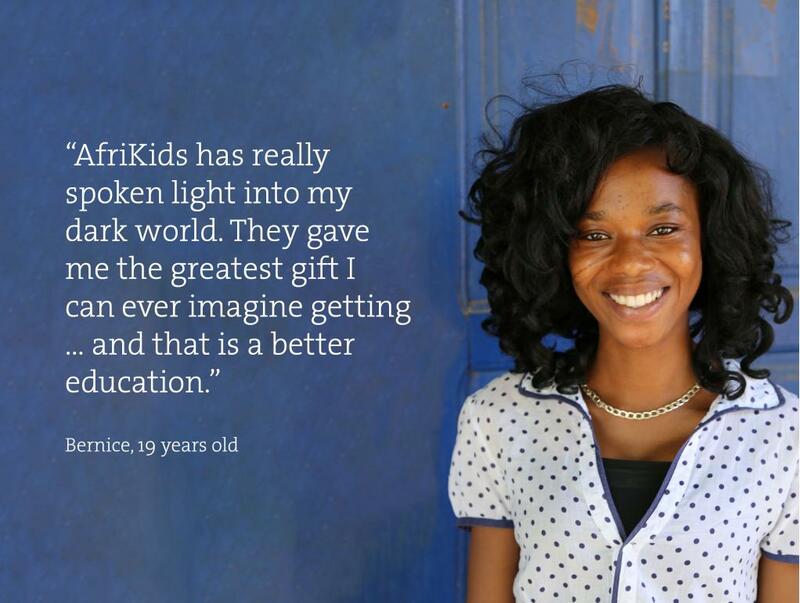 AfriKids helped Bernice to change her life. ‘My thoughts and speeches are full of AfriKids because a day never passes without me expressing my profound gratitude for the immeasurable help and support. Life was so difficult for me because we were forced to live an isolated life as nobody talked to us nor came near us. I was also constrained to stop schooling because I was not allowed to join my colleagues for studies and that’s because they believed I would bewitch them. AfriKids has really spoken light into my dark world. They gave me the greatest gift I can ever imagine getting … and that is better education. AfriKids took my formless dreams and gave me a hopeful shape, where I joined students in school for studies without fear and panic. My life started its changing process when my dormant gifts and talents were resurrected again by AfriKids.